Season 1 of Syfy’s bio-thriller Helix was, by almost all accounts, an up and down affair. Still, it was strong enough that the cable network gave the Ronald Moore-produced series a season 2, which kicks off early next year, and to hype their original content, they released this action heavy new trailer. If you’re caught up on Helix, you know that the narrative eschewed the ice cold confinement of an arctic research base for a less snow-bound locale, an island in the middle of the sea, which offers a different kind of solitude and isolation. After discovering what is best described as a death boat, the intrepid CDC team investigates, but they’re not going to like what they find. Along with Defiance, Helix was part of the advance scouting party for the new Syfy, a sign that the often-mocked network was shifting its focus back to making actual, serious science fiction, as opposed to lightweight fantasies and horrible “reality” programming. Sadly, Helix’s first season was more frustrating than anything else, but it rallied towards the end in a way that actually left me curious to see what season two would bring to the plate. This new extended trailer leaves me tentatively optimistic. Check it out. We live in a time where most of the films that get wide theatrical releases leave little room for interpretation, incessantly explaining everything to death, with little subtext below the surface to chew on once the credits have rolled. On the opposite end of that spectrum is John Suits’ The Scribbler, a flick that quietly hit VOD over the weekend and mostly treats exposition as if it’s an infectious disease. Even when characters directly describe the things that happen, it’s still oblique and difficult to comprehend. But it sure does look cool. Let’s see if I can describe this without my manic side taking over. 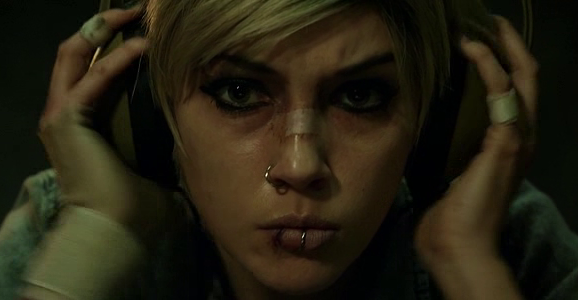 A crazy-eyed Katie Cassidy (Arrow) plays Suki, a woman suffering from multiple personality disorder. She was under the care of Dr. Sinclair (Billy Campbell), who treated her using a newfangled personality-destroying piece of machinery called the Siamese Burn. Once it’s determined she’s okay to enter the world again, she takes a home version of the Siamese Burn and moves into a halfway house for mentally unstable people. Beyond being a total shithole, the apartment building has recently been the location for a string of presumed jumpers. I’ve talked about John Suits’ futuristic thriller The Scribbler here before, and it’s always with a sense of “WTF is happening?” Not wishing to sound like a broken record in introducing the film’s recent NSFW international trailer, I of course don’t want to continue harping on the inarticulate approach to this movie’s marketing, but I’m delightfully intrigued all over again by sheer confusion. Maybe one of my other personalities knows the situation. Arrow‘s Katie Cassidy stars as Suki, a woman suffering from multiple-personality disorder. She moves into a halfway house with other former mental patients, attempting to cure herself with a new, experimental procedure involving a personality destroyer called The Siamese Burn. Each time Suki uses it to eliminate one of her other personas, the machine begins to change, affecting Suki’s life as it does. While America is currently on the cusp of falling down on our knees and worshiping a new god named Ebola—or something a little less dramatic—Syfy is putting audiences in danger of catching the NARVIK virus, which has wholly different side effects. 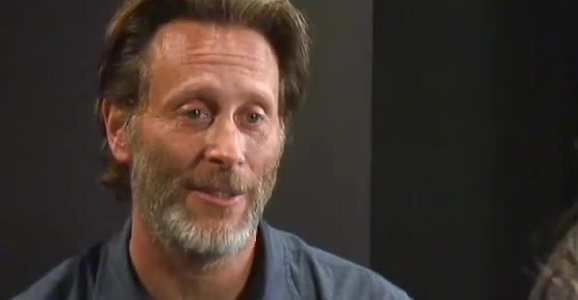 Helix showrunner Steven Maeda is putting all the gears in motion for season 2 of the twisty thriller, and he’s bringing TV veteran Steven Weber along for an antagonistic role. We can probably expect a mid-season reveal that he’s actually the father of at least half of the show’s characters. If you’ll recall, Helix ended its first season with CDC scientist Alan Farragut (Billy Campbell) searching for his ex-wife and fellow scientist Julia in Paris, where she was taken by Spencer “The Scythe” Sutton (Robert Naylor) and is now working for Ilaria Corporation. The NARVIK virus is on the move now, no longer tethered to the frigid Arctic Biosystems setting, and what’s the exact opposite of a quarantined set of labs in the middle of a frozen tundra? An island paradise, of course.